Frasers Gourmet Hideaway, in Oak Harbor, Washington, is a terrific restaurant with a nice atmosphere, friendly people, and great food. 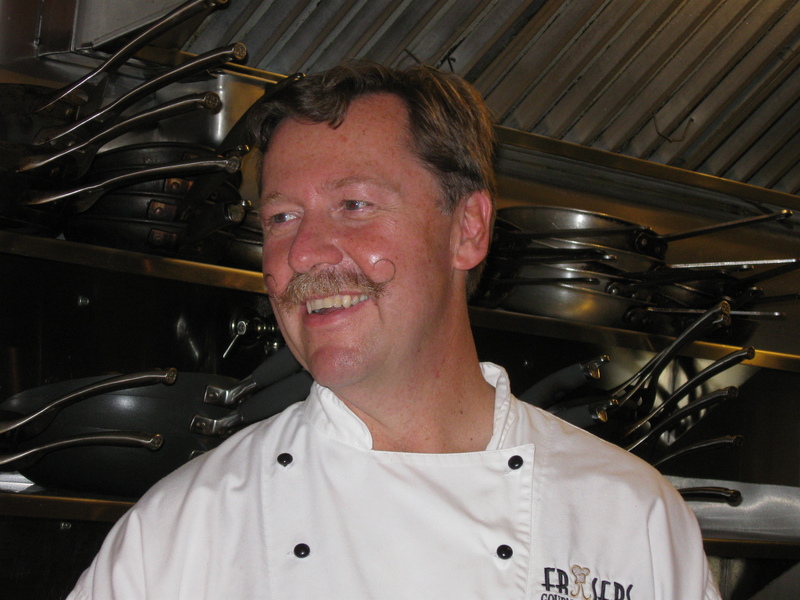 The chef, Scott Fraser, studied French cookery for years before he and his wife, Josee, opened their restaurant on Whidbey Island in 2006. I’m here to see what they do with the local seafood, and don’t expect a cuisine pro to be working with high school kids during the crowded, intensely busy dinner hour. But that’s what is happening. I’m sitting at a stylish, lighted onyx counter, watching the kitchen action, and Chef Scott’s helpers look too young for this. They should be out riding skateboards or something. It turns out they’re students from Oak Harbor High School, and the chef is coaching them for ProStart. This culinary competition brings young folk from every state to Kansas once a year for the National ProStart Invitational, and there, in a set amount of time, they prepare and present foods for judging. 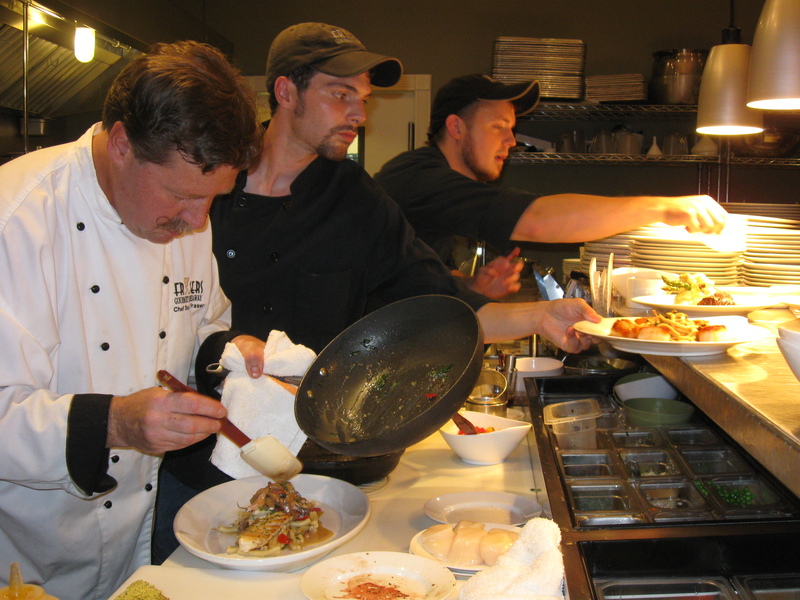 Food service management is another aspect of the event. It’s probably nerve-wracking, especially knowing the winners receive honors and scholarships for culinary careers, but must be fun, too. Scott Fraser takes several students under his wing and trains them to reach for the Washington State award and then the U.S. meet, which this year will be April 29-May 1. 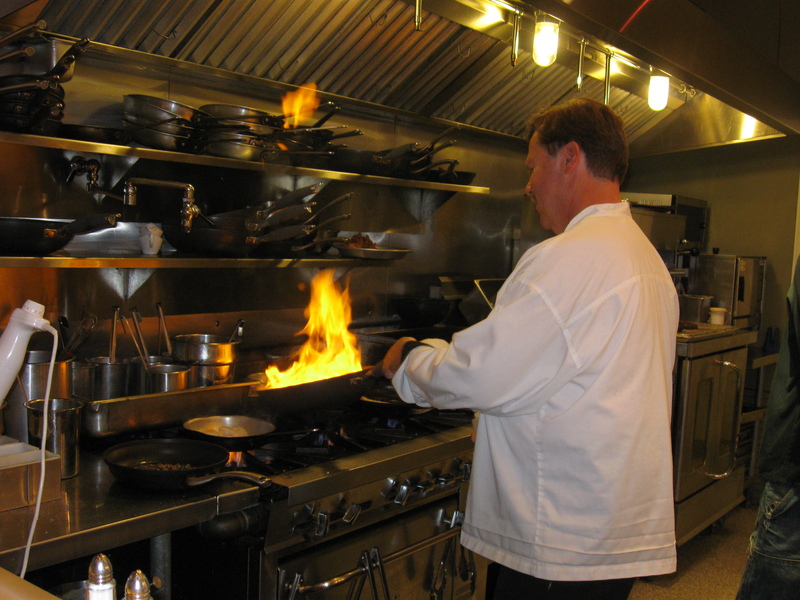 He is currently teaching them to prepare a 3-course dinner in one hour, using only two butane burners. Here comes my plate of seared sea swcallops, and they taste as fresh and tender as they look, beside sage and brown butter chanterelles on truffle stringozzi pasta. You can order land foods, too: lamb in herbs and pistachio crust, chicken with wild boar bacon and mushrooms, beef tenderloin on mushroom risotto. They’re excellent, but really, this is seafood country–chowder, Penn Cove mussels, Dungeness crab, and much more bounty from the sea. 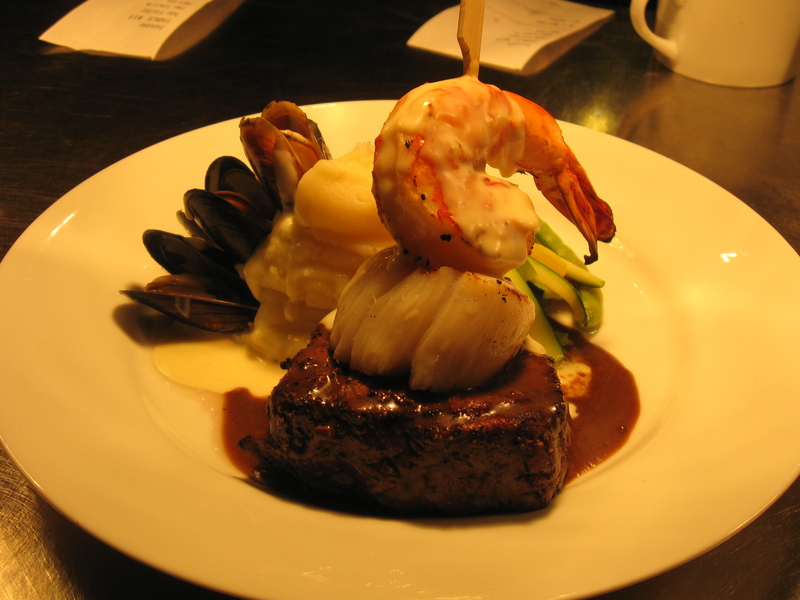 Or get the best of both, a combo of grilled filet mignon served with mussels, a fat prawn, and a scallop. 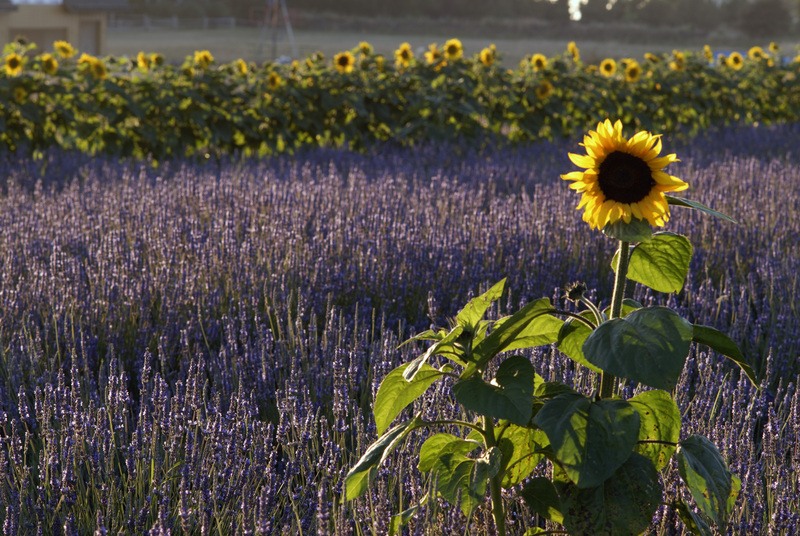 The ingredients are fresh and local, and most of the wines are from the Pacific Northwest. The young students move quickly and surely, and I’m happy to have my order in their deft hands. They smile, but they’re serious about this. I’m impressed and hope they find themselves in Kansas for the ProStart nationals. 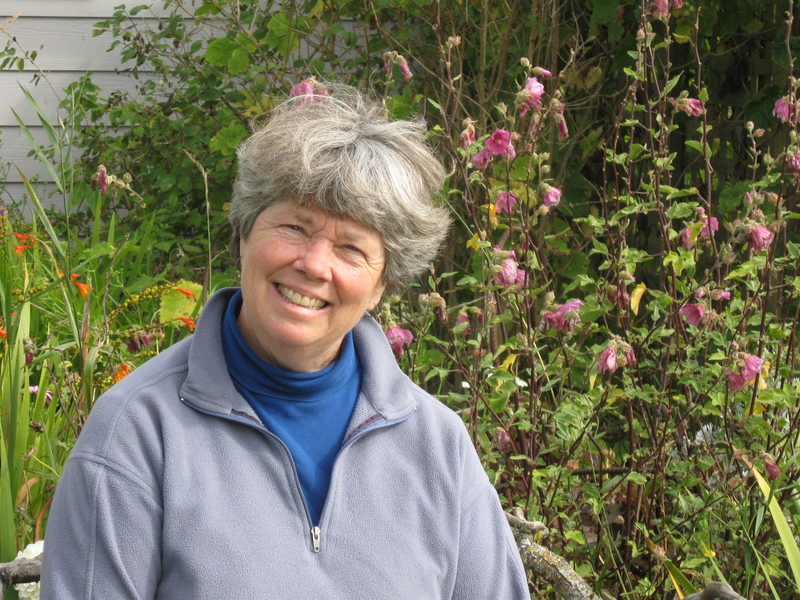 Coupeville, Washington, is quintessential small-town America. I half-expect to see Sheriff Andy and little Opie come whistling around the corner (TV’s Mayberry will be in re-runs for years). 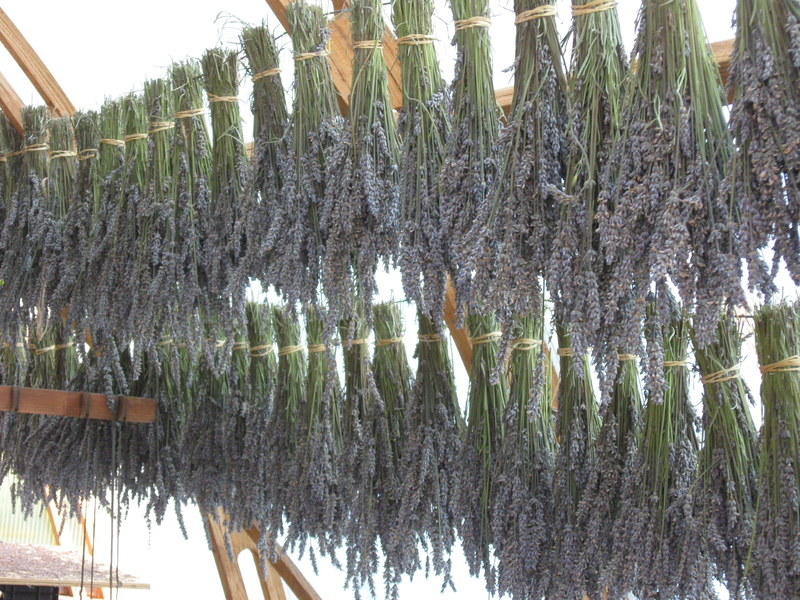 But Coupeville, in central Whidbey Island, has its own Pacific Northwest nautical flavor. It overlooks Penn Cove, where boats dot the waves and mountains rise in the distance. A long pier juts into the cove, and at the end, the red building that used to hold supplies and produce now has a nifty display of marine life, plus an underwater camera so you can see what’s going on beneath the wharf. 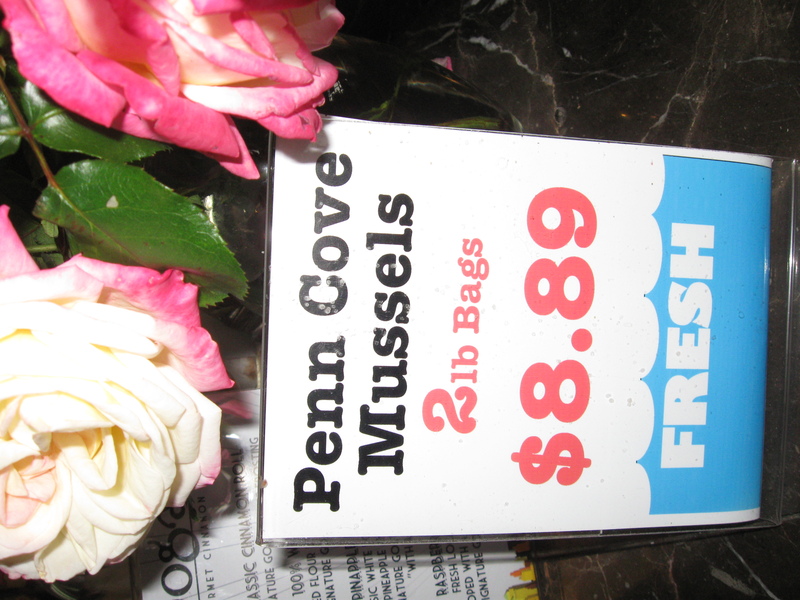 There’s a cafe, too, selling chowder and best-in-the-world Penn Cove mussels. The mussels are known for their incredible flavor, which apparently comes from water that isn’t too brackish, because it’s fed by the Skagit River flowing into the cove. Whatever the reason, those shellfish are special enough to have their own festival. This year’s was held this past weekend. Strolling along Front and Main streets, I’m charmed by the way history has been preserved, with Victorian houses and shops with Old West fronts and flower boxes. More than 100 buildings are on the National Historic Register. Coupeville isn’t stuck in the past, though. 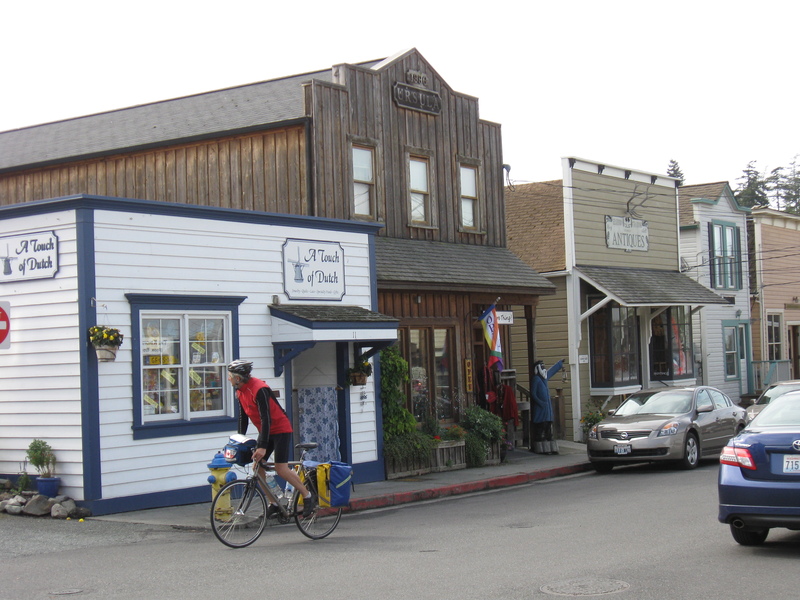 It’s busy with bicyclists, kayakers, hikers, sailors and beachcombers, and tourists like me poking into cute places such as Coupeville Yarns, A Touch of Dutch (get your Delftware and wooden clogs here), Aqua Gifts, and Sally’s Garden. 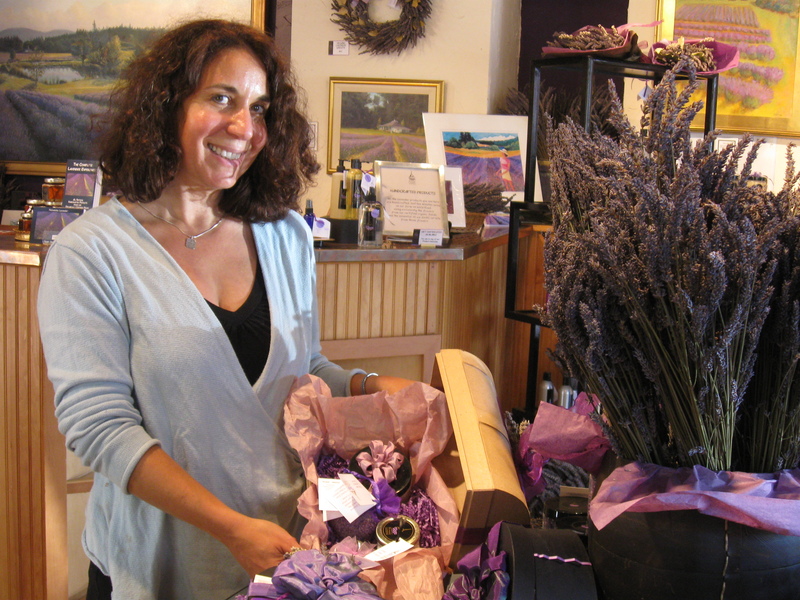 Sally’s is a browser’s dream, with pottery, orchids, glassware, exotic candles and a lot more. Those friendly Coupevilleans (Coupevillers?) love a festival. After the notable Penn Cove Mussel Festival comes the everything-green St. Patrick’s Day Parade, and in May, the Water Festival, with traditional canoe races and stalls where Native Americans from regional tribes sell artworks and food. Next is the Memorial Day Parade, when flags fly and music plays for proud marchers. Those are just a few of Coupeville’s celebrations I plan to return for. This would be a fun place to live. It’s also a great town for eating. Front Street Grill serves a good Asian salad, which I enjoy along with the water view. Probably the best known high-end restaurant is Christopher’s on Whidbey, a tad expensive but famed for its Northwest cuisine and local wines. Examples: salmon in raspberry sauce, port tenderloin with mushrooms, and Penn Cove mussels in wine and garlic. Snazzy desserts, too. Or you can go for cookies and milk for $3.95. Oystercatcher is also noted for good seafood. And I might stop in Toby’s Tavern, next to the water, for down-home atmosphere and, need I add, terrific mussels. For something quite different, I’ll cross the street to Tea & Treasure and sip a cup of pomegranate-pear tea. I can buy any of dozens of flavors of tea, along with a pretty cup to drink them from. 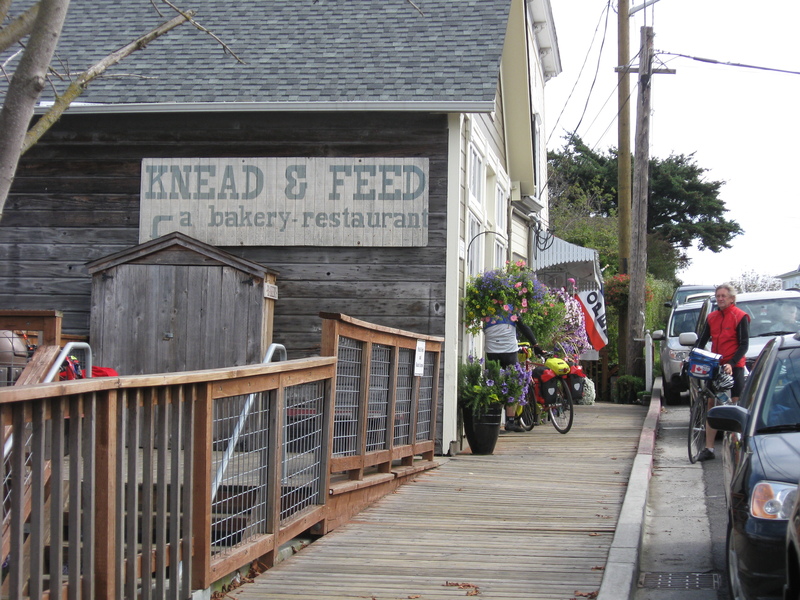 Then there’s Knead & Feed, where the tuna salad sandwiches are hearty and the bread and berry pies come fresh from the oven. Andy and Opie and Aunt Bee would love it.